Best Price Cost Rate For Limousine or Town Car From San Diego to LAX or Tijuana - Limousine Pricing - Limousine Rates - How Much Does a Limo Cost Generaly around San Diego? Sedan rates are based on trips and not on individuals. Up to 4 people can ride for the price of one. The safety of passengers is Town Car Limousine in San Diego's primary concern. Limousine rates are subject to change. 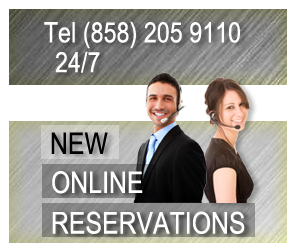 Please call for current rates (858) 205-9110 24/7. Town Car Limousine in San Diego uses Signature, Luxury Town Cars in peak condition. violations, hence, offering you a safe ride. ride at a moderate price. What makes Town Car Limousine in San Diego the best transportation service in San Diego? Read about the benefits that only Ajana Transportation provides. $1.00 off per minute late. Free ride if 15 minutes late.